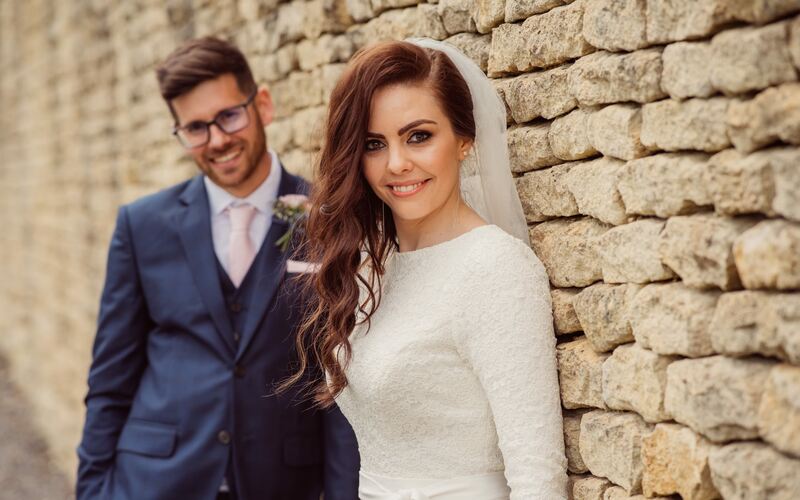 Kingscote Barn in the small picturesque town of Tetbury, Gloucestershire was the location of Laura & Lukes Cotswold barn wedding day. Probably due to the fact its such a great venue, snuggled in by the rolling cotswold hills making the perfect setting for a wedding. The only noise pollution was made by the sheep in the near field! Laura got ready at her home in Cheltenham, Gloucestershire only a half an hour drive away from Kingscote, I was with her capturing the getting ready process with her parents and twin sister (Bridesmaid) Emma. Perhaps the biggest surprise of the day was that Laura & her mum had made the wedding dress!!!! What an incredible thing to do. They are both so talented and I have absolutely no idea where they found the time!? Its just beautiful and fits Laura so perfectly. Such an incredible achievement! I was really pleased that they’d chosen to have a second photographer on the day. A popular choice which enables me to hang on with the bride a little longer whilst also capturing twice as many candid moments throughout the day and getting two different view points during the ceremony/speeches & dancing in the evening. The guys headed over to the barn in the morning to make some finishing touches and put their suits/ button holes on whilst catching up with the guests as they arrived. I took the couple along with the bridesmaids and groomsmen off for a little wonder and a few photos around the grounds just before everyone sat down to dinner. The weather at this point was so perfect, even after a little rain in the morning. Although my absolute favourite time to get some couple shots is after the meal just as the suns getting lower in the sky so we popped out to do this as well and i’m so glad we did! Have a look at the little slideshow which shows a handful of shots from their pretty day. If you’d like to view a full gallery for a barn wedding or Kingscote in particular feel free to get in touch!